Kim Yu-Na brought her best to the Olympic stage (collective sigh of relief)! I don’t think there’s anyone out there (except one japanese judge, and a couple thousand japanese fans) who didn’t want her to lay it down here, and win. She deserved it, and it is was hers to lose. What sets her apart? Her speed is notable, but unlike any of the other woman, she is a true actress. Every moment is part of telling the story, or creating the character of this flirtatious Bond Girl. She’s not just going through motions, or showing us that she’s thinking about her next element. What is so surprising about her is that out of makeup she looks like the asian girl next door…but with the makeup, and when she’s ON, she really does become Queen Yu-Na, her equivalent of “Sasha Fierce! ?” Sandra Bezick stated: “She is a bit of a Tom-boy…she likes to jump.” Huh? Perhaps with this comment the ladies’ and men’s competition should indeed meld, as Plushy seems to think! Someone’s comparison of Rachael Flatt to Elaine Zayak was apt. I have always thought that…perhaps 2/3 Zayak, 1/3 Sumners. Just before her skate, Peggy & Dorothy were captured in the stands, like the two old codgers Statler & Waldorf gossiping. Peggy looked like she either wanted to duct-tape Dorothy’s mouth shut, or was counting the minutes to her next drink. I’m sure it’s hard for her to face the slow demise and phasing out of her commentating career. Rachael’s skate was very strong, complete with 3F/3T. She was a bit tight throughout, and not as effervescent as at Nationals, but she did the job, and under great pressure. Surely she must know the negative history that she and Nagasu are threatening to make. Her straightline footwork pass is the highlight of this program. It is very fun, and had a lot of appropriate swing/big-band character. 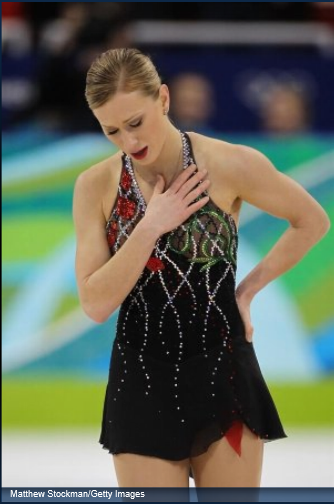 There are no words for Joannie Rochette’s performance and accomplishment. Her camaraderie with her coach, Manon Perron was touching throughout. She was very clearly “in the moment” throughout her skate, giving attention to each and every element, and the transitions between. 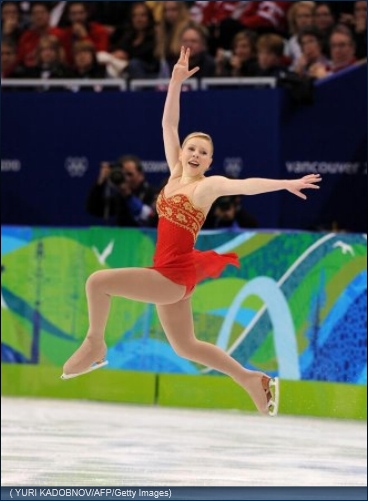 The quality of her skating (edging), and its danceability is the best in the competition. I prayed she could repeat this level in her FS, and remain in the top three. Thankfully, she had a 6 point lead, which would allow her a single mistake. Commentator silence, during a program, is the most complimentary and telling gesture of all. Did you notice that during Rochette’s, as well as Voir’s skates they were surprisingly mum? Rachael Flatt got the final six off to a stellar start. From the moment she started, she made me feel at ease. Her smile and relaxed carriage were immediate proof that she was not going to succumb to nerves (has she ever? ), and was very present to the challenge. I agreed with Bezick, and felt she saved her best for last. She was freer and more expressive here than at Nationals, certainly. There was a real ease to all her elements and her flow throughout. I felt she was undermarked by about five points, or so, and should have finished in 6th. However, I did not have the benefit of seeing Lepisto skate (thanks NBC). Miki Ando felt slow, and her jumps were sticky, not having the height or attack we’re used to seeing from her. She looked tired, and overall the program was dull as dirt. Her costume was an improvement over prior season iterations…more feminine and seductive. BUT, her hairstyle/cut was SO off…too much Mia Wallace, and not enough Cleopatra. Selfishly, I was happy her tepid performance left room for Rochette, or an American woman on the podium, should Rochette falter. Kim Yu-Na owned the ice. Never once did she reveal the pressure she was under. She didn’t let up on a single element. I did feel a previous performance or two this season had more passion, but this was negligibly more cautious. Her engagement with the audience and judges is so rare at this level. None of the other woman make that connection, AND deliver the technical ammo she does! CJ called her “an angel.” Effectively she “closed the door” on Mao and Joannie. Thank goodness Koreans could sleep the night, so she will not be waterboarded or tarred-and-feathered. Whew! I can’t believe the pressure Asian countries put on their skaters, or any prominent figure, to serve as an icon for their prosperity, and uphold their success. Mao Asada is a fighter. You can just see it in her face. She will not settle for second best, and she never gives up. Many of us felt she should have abandoned her quest for multiple 3As, and focus her efforts elsewhere, because that strategy was not serving her well (ie: she was off the podium at LA Worlds). BUT, she proved that she could pull it off, and beautifully. How amazing that such a historic moment was only good enough for silver. I still hope that in future seasons she rethinks her programs, and returns to more lyrical fare, as it will serve her and her innate softness much better. I was VERY pleased she also kept Miki off the podium. Her jump prep slip-up and consequent pop was odd, but thankfully didn’t mar the program too much. It’s amazing to consider that Joannie Rochette’s scores and programs would probably have brought her gold at the Torino Games. That shows you how high the bar is this time. Joannie continued to maintain her courageous control, in her time of loss. I was SO happy she seemed to secure her bronze, with only Mirai left. Should she retire, she can add this to the memory of her perfect skate at Canadian Nationals, as well as her silver from LA Worlds. She is a beautiful woman, and just exudes graciousness. We were all rooting for you Joannie, and you gave us something very special to remember! I feared the intense, almost unstable look on Mirai Nagasu’s face before she went on the ice did not bode well. I was concerned it meant she wanted it too much. But, she layed down a perfect program, with fewer jump rotation downgrades than at Nationals. She did not skate with caution. Very few predicted a placement as good as fourth for her. And, how lovely for her to respond with excitement to that placement, rather than disappointment, as most skaters at this level would. Hopefully, this means she won’t have to return to “her own little corner of her own little storage closet.” I was so proud of our American girls. Both skated perfectly and at their individual inspired best, excepting a few downgrades. They can be proud, and not feel the weight of bringing the end of our historic ladies’ podium reign. jcm’s costuming thumbs-up: Joannie Rochette’s SP, dramatic dark base with sparkling sequins and a beautiful single rose on her back; Akiko Suzuki’s SP, stunning, fiery orange under-color, lilting, curving ruffles in her skirt; Cynthia Phaneuf’s SP, sea-foam blue-green, understated elegance; Kim Yu-Na’s LP, elegant, poised, classy, cool blue. Thumbs-down: Miki Ando’s SP (BUT an improvement! 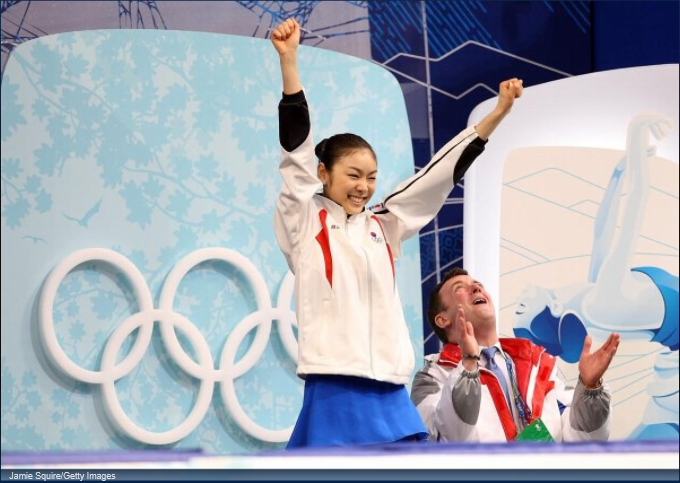 ), too severe; Mao Asada’s SP, “Best Little Whorehouse in Vancouver,” perhaps Evan will be her Burt Reynolds? I was pleased to hear Ben Agosto say the following about their Vancouver experience: it was an “interesting development in our…personal outlook on everything.” We are “satisfied.” I genuinely believe they feel this way. It doesn’t seem they are putting on a face for the media. That’s a nice feeling. He and Tanith (who a friend refers to as “Tanith Elbo”) claim they have not a single fight in 11 years. Wow…REALLY? Should I believe that? And, Davis & White claimed “we have ’em beat.”…with 13 years, and no fight! 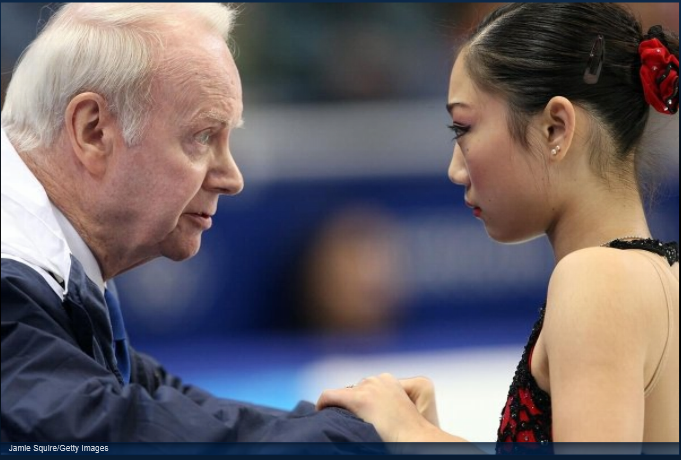 When talking about their FD, Charlie White offered up one of the best quotes of the Games. When skating this program, he said he just imagined: “What would the Phantom and Christine do, were they to twizzle?” He is an incredibly personable and likeable guy. I bet we’ll see him commentating in 4+ years. He’d be a great, fresh face and personality for the media side of the sport. As with with Susie Wynne, I could listen to Picabo Street’s commentary for days. She has great insights, confidence, and clarity. She needs a fashion stylist to save her from her bad fashion sense, but I can put up with that considering her gifts. She’s amazing! Thanks again JCM! Great recap, again you told me things I hadn’t heard before. I was so happy that the judging seemed right, not suspect (see Johnny Weir). I can’t believe that a skater with 2 3As and great spins and great spirals came in second. But Kim is otherwordly and I was happy for Brian. I thought it was pretty cool at the end of her program you could see Brian in the background and he had his hands in the air. I am the unusual blogger in that I haven’t seen any of these skaters before with the exception of some of the skaters from US Natls, so I was blown away. Just so glad they all skated well, they are amazing. I probaby won’t be able to see Worlds – will you do another recap? My pleasure, Ice Charades! I imagine I will do a recap of Worlds…perhaps a “Best of…”, rather than a blow-by-blow! We shall see. Great recaps – and thank you so much for pointing out the Charlie White twizzle quote. Possibly the best thing I have heard all year, and Terry Gannon was still laughing about it days later. I really enjoyed the part about Yuna Kim and I absolutely agree with your saying “None of the other woman make that connection, AND deliver the technical ammo she does”. She really does.